Just one day after we reported on a pair of songwriters filing a $20 million lawsuit against Ed Sheeran for allegedly ripping off one of their songs for his hit “Photograph,” another superstar is being accused of stealing from some non-famous person. 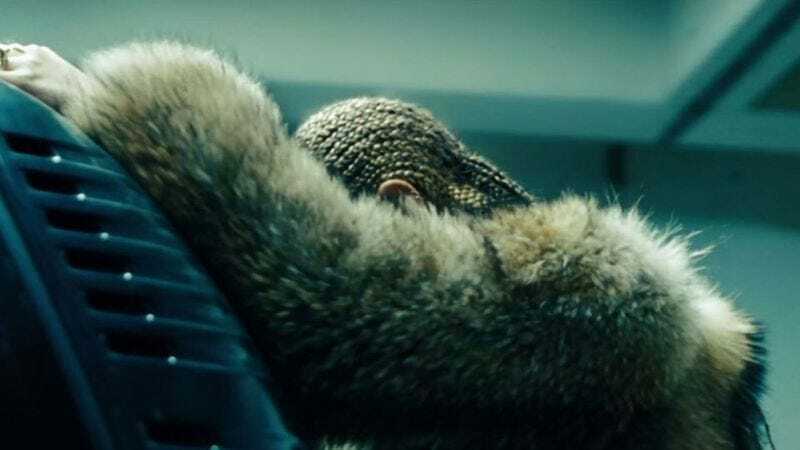 This time, Beyoncé is the one facing the accusations, but it’s not because of her music. It’s actually because of the trailer for her HBO Lemonade special, which a filmmaker named Matthew Fulks believes is a ripoff of his short film Palinoia. This comes from The Hollywood Reporter, which says that Fulks sent links to Palinoia to some people at Columbia Records regarding a possible gig directing a music video. Apparently, he was also in contact with a guy named Bryan Younce, who has worked on Beyoncé videos in the past and theoretically watched Fulks’ short (and is definitely not Beyoncé herself with a fake mustache, despite the name). THR says the filming of Lemonade began a few months after all of this, so there would technically have been time for the Lemonade people to see Palinoia ahead of time. Fulks is asking for “all profits attributed to exploitation of his work, including from sales of the Lemonade album,” which means he’s casting a pretty huge net, and could eclipse other, similar high-profile lawsuits if he wins. You can see the Lemonade trailer and Palinoia below. Keep an eye out for red persons, a parking garage, and title card screens.